The largest member of the A5 family adds extra practicality to a winning recipe of high quality, classy looks and a decent drive. A very talented rival for the BMW 4 Series Gran Coupe. The A5 Sportback looks the business, but it’s more than just a pretty face. A spacious, stylish and beautifully built interior is augmented by reassuring handling, low running costs and fine performance. OK, so it’s not quite perfect, but the Sportback remains a fine all-rounder: relaxed as a long-distance cruiser, but still capable of putting a smile on your face away from the main road. Fine performance, low running costs and a good package of equipment – what’s not to like? Interested in buying an Audi A5? 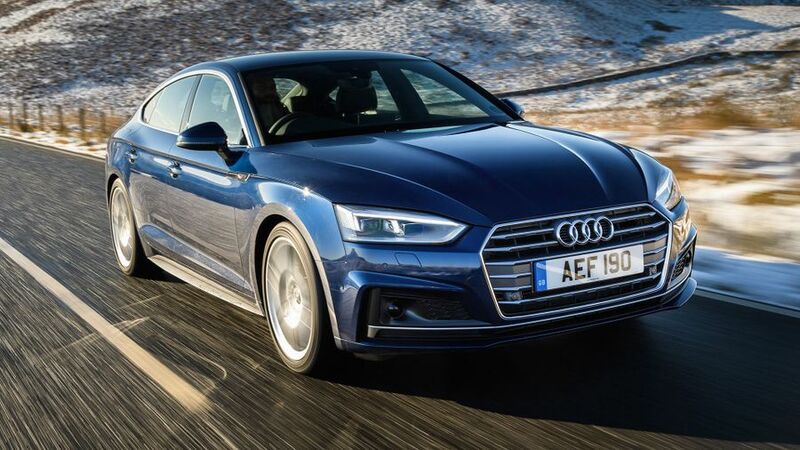 The regular Audi A5 Coupe is one of the most handsome mid-size coupes, and the good news is that adding a couple of extra doors has done little to upset that winning formula. Like its smaller brother, the A5 Sportback has a bold, wide grille, sharp lines and lots of chrome detailing, all of which combine to create a classy, muscular appearance. Alloy wheels are standard across the range, but if you step up to Sport from basic SE, you get some more aluminium highlights on the body, while the S line trim brings larger alloys, LED headlights and a unique bodykit. It’s also worth noting that there are only two standard colours, so if you want your Sportback in anything other than black or white, you’ll need to tick a box on the options list and pay a little more. The A5’s interior is typically Audi: typically immaculate. Adorned with impeccable materials and assembled with zealous attention to detail, there are few mainstream rivals (yes, including BMW and Mercedes) that can match the A5’s air of substance and quality. While the interior panels all cosy up to their neighbours perfectly, each switch and every control is weighted and balanced to communicate a sense of silky precision. Additionally, all the usual touch points are thickly padded and trimmed with plush materials, while the steering wheel and gearstick look and feel reassuringly expensive. 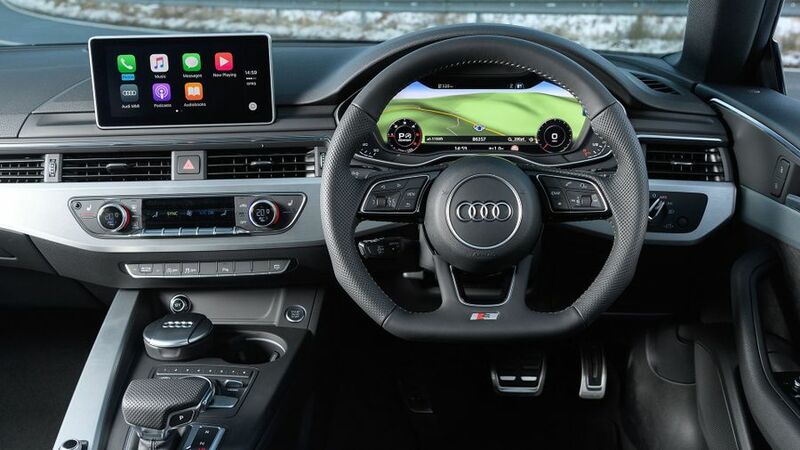 All of this is before you add in the option of Audi’s ‘virtual cockpit’, which replaces the conventional dials with a full-LED display, ultra-high definition screen quality and iPhone-like configurability, to give a highly effective blend of technology and sophistication. The Sportback has a longer wheelbase than the standard A5 coupe, and most of that goes into improving the room in the rear seats. The result is that the excellent room in the front seats is complemented by decent room in the back. Most passengers will be perfectly comfortable, and only those way over six feet tall will find themselves having to duck a little to get in, or find their heads touch the ceiling and their knees brushing the backs of the front seats. However, the high transmission tunnel running down the centre of the car means the middle-rear seat is all but useless. Last, but not least, the boot will take 480 litres and it has a nice, wide opening, although there is quite a high lip to lift things over. And, unlike many rivals, the A5 comes with a 40/20/40 split/fold rear seat as standard. The first thing to realise about this car is that, despite its name, it doesn’t feel all that sporty to drive. Instead, it feels more like a grand tourer, most at home on sweeping main roads, rather than tight, twisty B-roads. Drive it, and the words that spring to mind are things like ‘sure-footed’ and ‘undramatic’ – but we mean that in a good way. 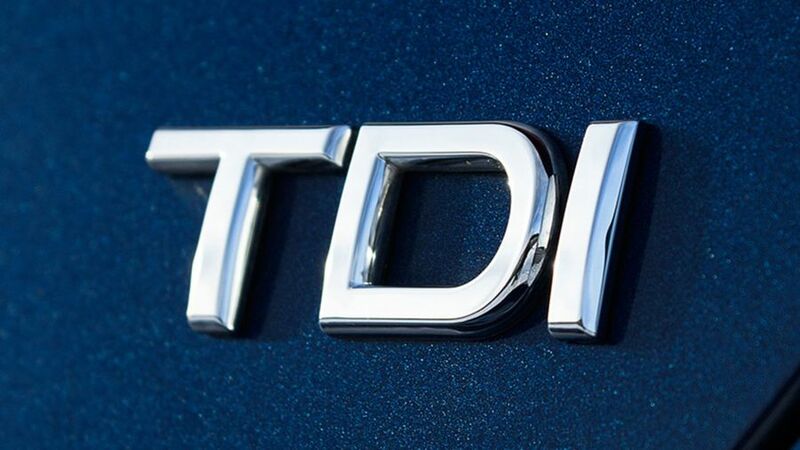 The result is that you can cover ground at quite a lick, as even the front-wheel drive diesel models seem to have huge levels of grip in the dry, and body roll is kept in check very effectively. However, there are a couple of disappointments. First, the steering is almost completely devoid of feel, which means the car isn’t as engaging or involving as, say, a BMW; a shame in a car with ‘Sport’ in its name. Second, the ride has a noticeably firm edge to it, especially at low speeds, although it’s nothing you couldn’t live with. We’ve only driven one version of the Sportback so far, but the good news is that, even though it had the economy-focused 187bhp 2.0-litre diesel engine (the least powerful in the range) it’s plenty quick enough. Better still, it’s also extremely smooth and refined, and the way it delivers its power – with strong pull in the mid-range, and no real need to rev it to the redline – perfectly suits the way the Sportback drives. It’ll get you away from rest without a problem, happily takes advantage of overtaking opportunities on the open road, and will get you to the motorway limit with hardly any effort. Although we’re yet to drive them in this car, we know from experience in the A5 Coupe that the 3.0-litre V6 diesel delivers properly spirited performance and sets the benchmark for refinement and economy, while the four-cylinder 2.0-litre turbocharged petrol engine is also pretty immaculate. This is another area where the Sportback is properly impressive. Its relatively light weight and aerodynamic shape help the cleanest front-wheel drive diesel, fitted with the seven-speed twin-clutch transmission, emit just 106g/km of CO2 and return the best part of 60mpg, meaning very acceptable bills for fuel and tax. Choose the more powerful V6 diesel and your tax implications only rise by a couple of percentage points. The petrol engine does a decent job, too, with the 2.0 TFSI managing almost 50mpg, even with four-wheel drive. While servicing and other running costs such as insurance will be on par with its rivals’, A5s have traditionally strong residual values, so you should get back a good chunk of what you initially invest when the time comes to sell the car on. It seems like a bizarre state of affairs – especially given the solid look and feel of its products – but, as a brand, Audi has never fared particularly well in customer satisfaction or owner reliability surveys. As a result, the company sits well down the manufacturer rankings in Warranty Direct’s Reliability Index. Mercedes, BMW and Jaguar all perform better. The previous A5 put in a poor showing, too, but hopefully, with all-new oily bits, Audi can only improve on its patchy record. 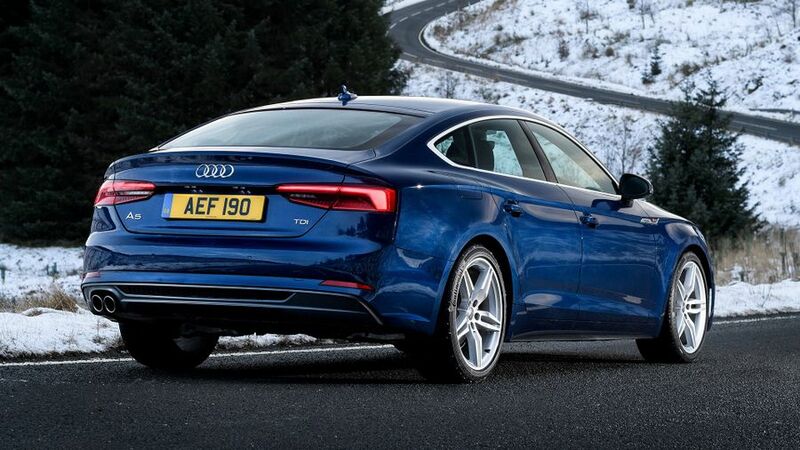 At the moment, though, it's too early to know if the A5 Sportback will buck the trend. The A5 provides an extensive suite of technology to enhance safety and comfort, including the City Safe system that automatically brakes the car if it detects an impending collision. 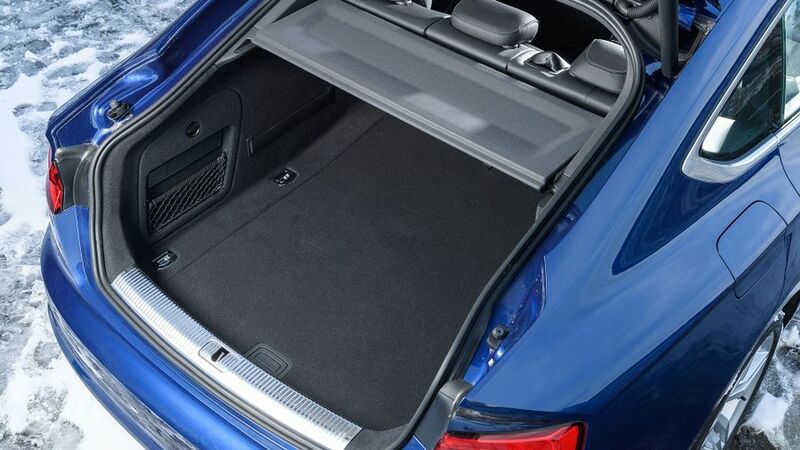 The car also comes with six airbags, anti-lock brakes, traction- and stability control and a pop-up bonnet to help reduce the impact suffered by pedestrians or cyclists in a collision. All this kit helped the A4 (on which the A5 is based) achieve a maximum five-star rating from Euro NCAP. If you want to go the extra mile, there’s also the option of stop and go traffic assist, which uses radar to stop and start the car in heavy traffic conditions while maintaining a safe distance from the vehicle in front. Traffic sign recognition and a head-up display are also options. All A5s come reasonably well equipped, but they’re no more generous than major rivals from BMW and Mercedes. Three-zone climate-control, cruise control, keyless go and xenon headlights and LED running lights are standard on all models, as is a seven-inch infotainment screen, a three-spoke steering wheel and sports seats. S line adds leather- and Alcantara-trimmed pews, complete with embossed S line signature and four-way lumbar adjustment. While SE and Sport models come on 17-inch alloy wheels, S line models feature bigger 18-inch wheels and lowered sports suspension. Consequently, you’ll be well advised to take a test drive, to see if you are comfortable with the firmer set up before being seduced by the lowered, more aggressive stance. The A5 is a stunning-looking, beautifully appointed and reasonably practical executive car. With any engine, it provides strong performance and predictable high-speed handling, but its real forte is as a refined, long-legged, high-speed cruiser for discerning drivers who regularly devour high mileages. If that sounds like you, then an A5 Sportback could be right up your street.